The bookplate that eludes identification! I decided the way to track down the previous owner might be through the heraldic crest. After preliminary research, I thought it to be the crest of the Devonshire family from England as it matched one of their symbols. 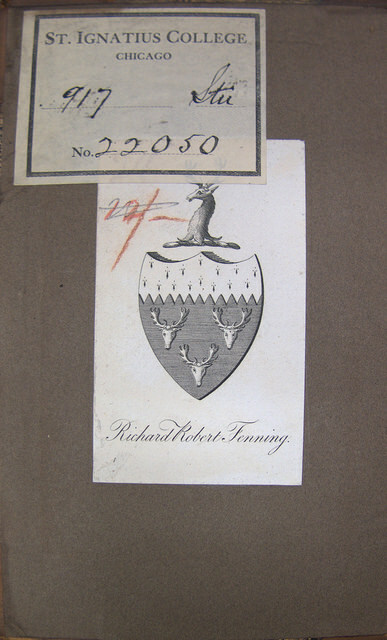 When I contacted the estate’s archivist, however, he confirmed for me that the bookplate did not belong to the Devonshire family. I spoke with him for a while and discovered that there were a hundred ways to decide whether a crest did not belong to a family, but there are very few ways to confirm who it does belong to. These crests can differ in very subtle ways such as the positioning of the animals, the number of antlers, and a thousand other ways. With the number of royal families, they would run out of the noble animals pretty fast if they were unable to differentiate in that way. I suppose this is why very few families adopt a gopher as their symbol. After further research, I found that anyone could have put this crest into our book as the U.S. did not care to police the use of family crests or symbols. Anyone could have adopted these three stags as their personal symbol when they owned the book. Ultimately, I spent a good ten hours with this book, and came up with few results. The experience, though, was still important. I found out more than I could ever need to know concerning family crests and learned something new about the history of families in the U.S. So even though the search itself was fruitless, that does not mean it was worthless.